In the Gospel of Luke 13:22-24 we see that “Jesus passed through towns and villages, teaching as he went and making his way to Jerusalem. Someone asked him, “Lord, will only a few people be saved?” He answered them, “Strive to enter through the narrow gate, for many, I tell you, will attempt to enter but will not be strong enough.” This warning is a promise comes with great sacrifice. This promise is actual. 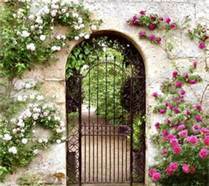 The narrow gate is hard to enter, for it involves casting earthly desires aside. Giving up the humanly appetite for possessions or power at school, work or within the community is difficult. These desires often lead to neglect of morality in the attempt to achieve these goals, whether through gossip or bearing false witness. Striving to be popular can lead to the breakdown of morality in the serving (or worshiping) of the status desired, rather than the serving and worshiping of God. Often, to achieve the desired status in work or the community, cut-throat actions are taken to raise personal status. These actions serve pride, greed, and lust rather than God. Giving up these actions, thoughts and these, quite frankly, idols, will allow us the chance to “be strong enough” to enter the narrow gates, as we turn our desires to loving God. The narrow gate is the cross! The only way into the kingdom of God is through Jesus and the sacrifice of his life on the cross, for us, a sinful people. This love is renewed when we worship in Church or at the synagogue, if we are focused on worship, devotion and the teachings at hand. To learn the Bible, is to learn God’s Word. Missing an opportunity to learn the Word is missing an opportunity to grow closer to God and be filled with the Holy Spirit. My question is–would you want Jesus to daydream when the final Book of Works is being read as described in Revelation? The destruction of humans that did not heed the warnings has already been seen with the story of Noah. For 120 years, Noah and his sons followed the word of God and heeded his message to build an ark. They built it to his specifications, and after 120 years he gathered up 1 male and 1 female of all the animals of the earth onto this ark. Finally, God told Noah and his family to get on the ark and shut the door and seal it. Ironically, those that ridiculed him and his family for 120 years were left to drown along with the rest of the earth. So too is the message of Jesus. The promise of the ultimate and eternal consequence for choosing the addiction of earthly possessions, feelings, wants and desires is promised. Jesus will knock on our door and we have the choice to let him in or leave him outside. Jesus will not beg for us because he has already suffered and died for us; rather, he will forgive those that are sorrowful and repent. Repentance is not just the admission of sin, but rather the admission of sin along with the change of behavior to avoid repeating that sin. Many are taught that if you confess their sins that they are forgiven and will enter the kingdom of God, but be cautious! The life changing beauty of confessions are that you have a new beginning to go out and sin no more. Do we heed this promise and warning, if you will, or continue through the wide gate that many take, but leads to destruction?